Providing the ultimate true-to-life sound experience, BeoLab 1 will open your eyes and ears to what a loudspeaker should look and sound like. "BeoLab1 is for everyone who has a heart for superior sound. You can turn your stereo up as loud as you want and still experience music the way it was meant to be. " 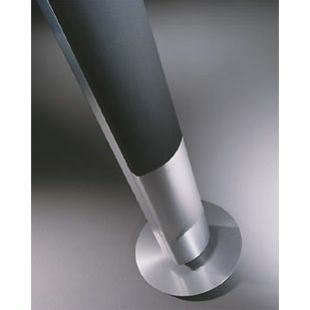 The quality of a loudspeaker has never only been about its ability to play loudly. What's just as important is being able to hear the finest nuances in your favourite piece of music - regardless of whether you're listening at the highest or lowest volume level. As our most powerful loudspeaker, BeoLab 1 will fill the largest room in your house with a sound that's as close to the original as you can possibly get " - B&O catalogue 2001 - 2002. "When it comes to sound reproduction we believe there's only one relevant parameter: How close can we come to the originally recorded sound. We feel an obligation not to disturb the intentions of the artist by adding unnatural elements to the acoustic image. Therefore all Bang & Olufsen loudspeakers share the same goal. They differ in size and shape and in terms of sound pressure level. But they are all developed to reproduce the natural, unaltered sound as closely as possible" - Bang & Olufsen catalogue 2001 - 2002. If the sounds you listen to, reflect the mood you're in, then BeoLab 1 is an invitation to express yourself to the full. Behind the elegant design lies a powerhouse of sound technology that can enhance the best of movies or take your favourite piece of music to new heights. BeoLab 1 will, quite simply, open your eyes and ears to what a loudspeaker should look and sound like. 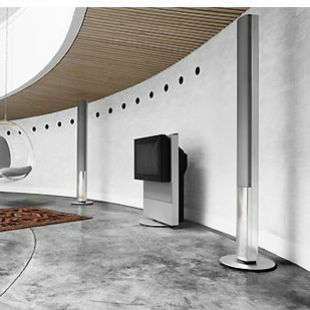 BeoLab 1 delivers the purest, clearest sound ever heard from a Bang & Olufsen loudspeaker. With aural reproduction as close as you can get to the original, it allows you to distinguish each instrument playing in an orchestra and every word of a song. A single continuous piece of aluminium forms the rigid backbone of BeoLab 1. Strong enough to withstand the powerful vibrations, its curved design also eliminates any sharp edges or joins that could compromise sound quality. Why build amplifiers into the loudspeakers instead of keeping them separate? Because you can reduce the size of the cabinet volume to one-third of the size of a conventional loudspeaker with the same sound capacity. 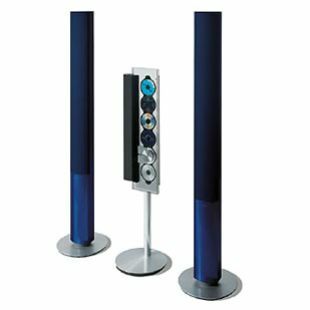 The principle is called Active Loudspeakers, and what you get is a compact loudspeaker that can play at high volume without distortion or damage to its drive units. Furthermore, when amplifier, treble and bass units are paired for the same task, they can be tailored to compensate for each other's shortcomings. What you hear is music that sounds exactly like the instrument it originally came from. 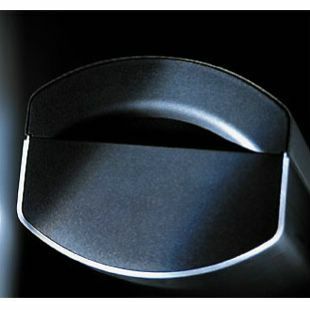 Adaptive Bass Linearisation (ABL) is a process patented by B&O and is incorporated in BeoLab loudspeakers. The idea is to use the surplus capacity in amplifiers and driver units, arising by normal listening levels, for a bass extension - a sound reproduction with more bass, than the loudspeaker otherwise would be able to produce. The function is adaptive. This means that the loudspeaker adapts to the signal it receives. Loudspeaker drivers are therefore fully exploited, without suffering mechanical or electronic abuse, and the built in amplifiers are not subjected to signals would otherwise create an overload situation. ABL gives stunning bass reproduction considering the size of the loudspeaker in which it is incorporated, under normal listening levels. BeoLab 1 also makes use of Bang & Olufsen's innovative ICEPower® technology. With practically no electric power loss and a greatly reduced cooling space, the new, compact digital power amplifier allows the bass unit in BeoLab 1 to produce a sound far beyond the dimensions of the cabinet. "When the concept for BeoLab 1 was decided on almost two years ago, there was a lot to live up to. The loudspeaker project changed names several times during the process. First it was called Loudspeaker 8, then 12, 14, X and finally 15. Later on the commercial name BeoLab 1 was chosen. From the start it stood tall at two metres. Then it was reduced by a few centimetres to the present 1.84m. Nonetheless, BeoLab 1 is actually only half as large as the Penta in terms of physical volume and only three times larger than the BeoLab 8000. The basis for the development work was to create a loudspeaker which delivers perfect sound in terms of tonal balance and authentic reproduction, with compactness of expression but also high sound pressure, which is easy to integrate with the design and furnishing of the home and which can be placed anywhere. It was truly a great challenge to achieve all this in one and the same loudspeaker. There was no doubt that sheer amplifier power was needed to replace high volume. However, this also entailed a risk that a loudspeaker might burn up. So the department designed a completely new protective circuit which automatically turns down the amplifiers in extreme conditions, to reduce the heat in the loudspeaker units. So there is no risk of it burning off. BeoLab 1 also features ICEPower®, which is a revolutionary new Bang & Olufsen technology entailing high energy savings due to the low heat development. Another difficult problem to solve was that it had to be possible to adjust the loudspeaker to any room, to achieve the optimum listening experience. This is a question of avoiding too much bass when the loudspeaker stands in a corner and too little bass when the loudspeaker stands freely. The solution is the option to adjust the loudspeakers manually to give the same tonal range, no matter where they are placed. Throughout the production process the loudspeaker is developed to ensure simplicity at every production stage. So this is an extremely robust, soundly crafted, product. During the process the department received a nasty shock, however, when they carried out the first tests in a hot, humid environment. The loudspeaker just would not function when it was released from the artificial tropical paradise at the Struer site. A new trial was run and the same thing happened. Now the department's engineers were sweating as much as the loudspeaker had done in the heat cabinet, until it was discovered that the temperature had been turned up an excessive 15 degrees Celsius and the humidity by 3% more than the already very stringent test requirements. So when the loudspeaker was opened, the water practically flowed out of it. It must have entered as steam, the same designer states today and cites an example of how a BeoLab 1 was shipped as air freight to Singapore. On its arrival, faults were found in the mid-range loudspeaker where the membrane had subsided inwards. The simple explanation was that the cabinet behind the mid-range unit was so impermeable that it could not equalise the changing air pressure during the flight. So the solution was to make a small hole in the mid-range cabinet, to avoid this problem. Difficult cabinet process It is not the intention to adjust the cabinet to excess. It is the largest aluminium profile B&O has made so far and in fact one of the largest in Europe within high-gloss alloys. In practice, the profile consists of a very fine surface which due to its size is very difficult to manufacture without flaws. However, using specially manufactured equipment technicians have managed to achieve a polish which is both beautiful and perfect. The process is difficult, however, primarily because the profile is both flat and round. This in itself makes the polishing work difficult. Despite its complexity the BeoLab 1 has a shorter production time than the Penta. One reason is that the entire amplifier section is received ready-assembled from a sub-supplier in Scotland, but according to B&O's design and instructions. Furthermore, the technology is generally very compact. Engineers have devoted a lot of time and resources to this work. However, the investment is expected to be recouped via faster, more effective production. If you ask three of the men behind it - Villy Hansen, Poul Praestgaard and Henrik Sjostrand - to say what is most wonderful about the BeoLab 1, they all agree that its supreme quality is that when the user listens to music, he or she will forget to listen for the bass, mid-range tone and descant, but simply enjoy the music. Nobody remembers that the sound is emitting from the loudspeakers. Another aspect is the interplay between form and function. It lives up to what its appearance promises, even the great expectations of the sound experience created by its height. in addition to this comes its sheer force, the high precision of the bass and the authentic reproduction, as well as the simple and robust structure, which is also to the satisfaction of the customer setting up the loudspeakers. "It really is the best ever. It cannot be followed, and we have to say that an era is now over. We have quite simply completed the portfolio as it stands today. Now we have to use other methods to surprise. Idealand has been working on this and we will be back" the acoustics team state. Now they are all waiting in great anticipation to see whether the demand for Penta continues, even though it is no longer produced. As was the case with the BeoLab 5000, of which an American recently ordered 30 sets. When told that production had long since lapsed, he asked quite seriously what it would cost to start it up again. Once the surface has been polished until it shines like a mirror, it's dyed and given a tough ceramic coating that seals and protects the coloured exterior. The 5 strong colours match with the existing Bang & Olufsen range, and have been carefully chosen to compliment any environment in which they're placed. Choose between silver, blue, black, red or green (1999 - 2003 range). Switch off time (line) 3 min. Beoworld says: Accurate and imposing speaker - however strangely lacking in ultimate bass and sound often described as cool and clinical. The chassis is the basis of the much better received Beolab 9.